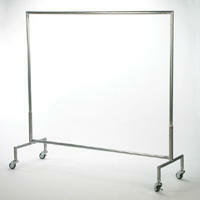 GARMENT RACK WITH HANGERS:CAN HOLDS APPROX. 50 COATS, 60 CLOTHES, 20 WEDDING DRESSES. DON'T FORGET TO ORDER COAT CHECK TICKETS. $3.50 charge for any missing hangers we use heavy duty hangers.